Are you looking for some quick no bake recipes for kids this holiday season? A perfect holiday dessert that fits the bill is an Italian chocolate log that resesmbles a salami (a hard cured Italian sausage). 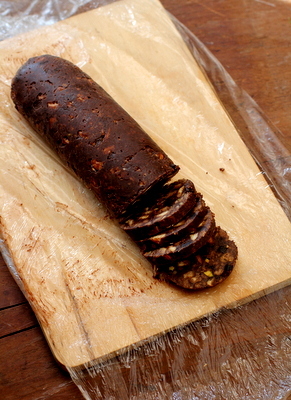 Chocolate Salami recipe is one of the easiest desserts to put together with the least effort. This no bake dessert recipe is popular in Russia, the Balkans and across Europe especially Italy and Portugal. The authentic version uses eggs, butter, biscuits, sugar and cocoa powder and is prepared during festive times like Easter and Christmas. 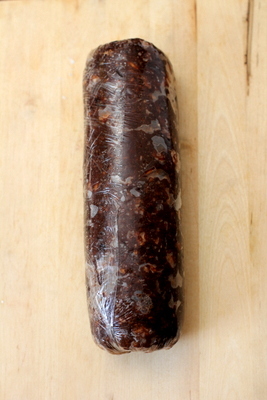 I have prepared an eggless version and adapted Giada’s chocolate salami recipe which is a winner. There are numerous variations of this popular dessert and the add ons can include assorted nuts like pistachio, almonds and walnuts and dried fruits of your choice. I used homemade rum soaked dried fruits and nuts. It can be served with tea or coffee or as an after dinner dessert which makes for a sweet ending to any festive celebration. 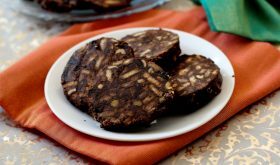 I would rate chocolate salami as one of the best Christmas dessert recipes! In bowl, break the biscuits into small pieces. Do not powder them. Add the rum soaked dried fruits and nuts OR chopped nuts of your choice and mix with the broken biscuits. Set aside. Place the butter in a stainless steel or heat proof bowl and place this bowl over a pot of simmering water (double boiler). Allow the butter to melt. Add the chopped dark chocolate and allow the chocolate to melt. Stir to mix well. Once the chocolate melts, add the powdered sugar and mix well. Turn off flame and allow this mixture to cool a bit. Add the chopped biscuits and nuts mixture to the butter-chocolate mixture and mix well. Cover the bowl with plastic wrap and place in fridge for 15 mt to 20 mts till it lightly hardens but moldable. On the work surface, place a layer of cling film/plastic wrap. Place the chocolate biscuit mixture in the center and shape into a log. With the help of the cling film to shape the mixture into a log. Once it is set, remove from fridge. Allow to sit at room temperature for 10-15 mts. Unwrap the cling film and dust with powdered sugar. (I did not follow this step). You can use chopped walnuts, pistachios or almonds. If you are in a hurry, place the log in the freezer for an hour or till it hardens and then remove, unwrap, slice and serve. By Sailu Published: December 12, 2013 Chocolate Salami recipe is one of those easy, quick no bake recipes for kids. 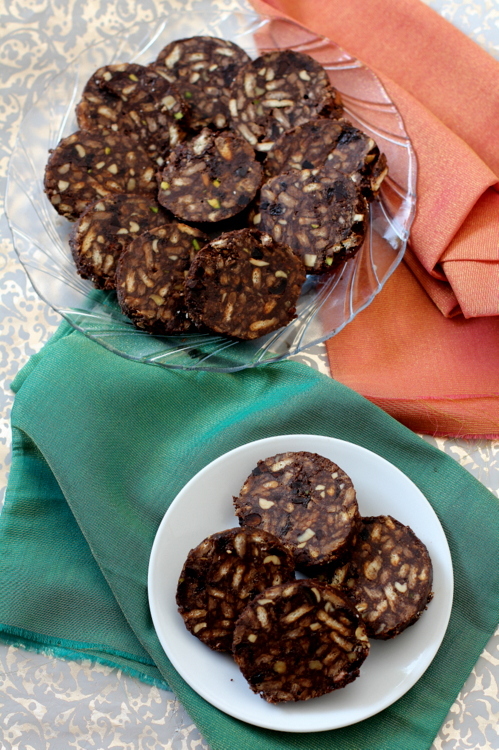 An Italian dessert made with biscuits, chocolate & nuts for Christmas gifting. 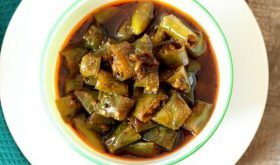 thanks fr the recipe Sailu! can you please let me know if the butter used is white butter or can I use salted butter like Amul butter? You can use white butter or salted butter like Amul butter. I’m planning to make them for a potluck…jus wanted to make sure..do they become sticky once they r out for long ? They should be fine as long its winter and not too high temperatures. Even if they are out for 3 to 4 hours, they don’t melt and become a mess. But as they soften there will be some stickiness.